Tesla Motors is approaching LG Chem, Samsung SDI and SK Innovation as part of its strategy to diversify its battery-sourcing channels beyond Japan's Panasonic. LG Chem is expected to win the Tesla business thanks to its output commitment, good pricing and on-time delivery. A solid partnership with LG Display could also help LG Chem. The company previously supplied batteries for Tesla's Roadster model, though the volume it shipped was "small." "Tesla intends to use more Korean technology on its Model 3. It decided to use tires manufactured by Hankook Tire and LG Display will possibly be supplying its OLED panels for the automotive systems. Additionally, Tesla is testing the manufacturing capability and production of LG Chem, Samsung SDI and SK Innovation," said an official, Tuesday. Tesla executives recently visited key research centers at LG Chem, Samsung SDI and SK Innovation, holding working-level meetings with all of them. An LG Chem spokesman said the largest battery supplier in the world has no official comment about its business with specific clients. Samsung SDI said it has no authority either to confirm or to deny business deals with its major clients. SK Innovation wasn't available for comment. The Tesla Model 3 is expected to drive the "third wave of adoption" in the electric vehicle industry. This third wave will finally attack the majority "mainstream and economically attractive" segment and it's been expected that others will follow including the GM Chevy Bolt, which should help propel EVs to the real tipping point of mass adoption. "This is why LG Chem, Samsung SDI and SK Innovation all are keenly interested in boosting their tie-up with Tesla. The three Korean battery manufacturers can't afford to lose the new business given the Model 3's impressive initial responses from customers," said another official. Tesla plans to produce up to 500,000 electric vehicles by 2018. The Model 3 will be available in 2017, at the earliest. The company has received 400,000 pre-orders. 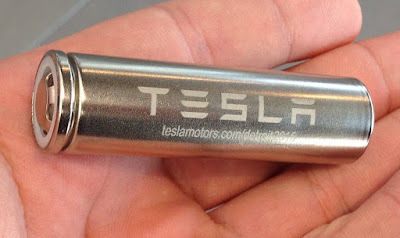 Currently, Japan's Panasonic is the exclusive battery partner with Tesla, supplying 18650 batteries as these are more economical and easier to mass produce. Both LG Chem and Samsung SDI are also manufacturing 18650 cells. Although LG is pushing the pouch-type battery as its mainstream product with Samsung SDI focusing on the rectangular-type battery, sources who are involved with the issue say Tesla may use LG and Samsung's mainstream technologies to keep adequate inventory levels as it's been widely expected the supply for the Model 3 will remain tight.